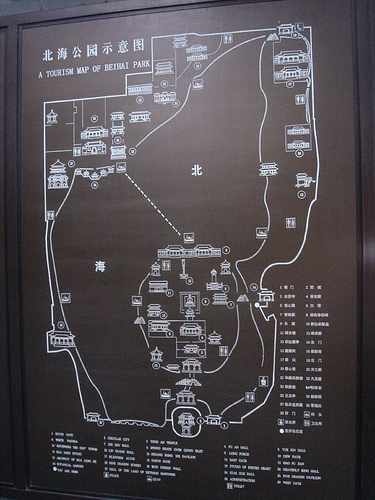 The map shows you all the attractions of The Beihai Park, it includes: King Wah Island, Wing Temple, Kunlun Stone, The White Tower of Beihai,etc. Beihai Park (Beihai Park) is located in the central area of Beijing, it is in the northwest of the Forbidden City. Belong to the ancient Chinese imperial garden. It is the centre of China,covers an area of about 71 hectares, accounting for 583 mu water surface, accounting for 480 mu land.